Probably the most important item during a local or national emergency is information. A good emergency plan should include the monitoring of TV, the internet and radio—especially the radio. The serious prepper should consider getting an amateur (ham) radio and license, even if he doesn’t intend to join in any ‘rag chewing sessions’ with fellow hams. Understanding the nature of radio waves and how radio antennas work can make a huge difference in the collection of information. No license is required for listening. None is required for the purchase of a radio. A license is required only when you transmit, and then you are restricted to specific frequencies, the mode of operation and the power of the radio signal. Spaced between the blocks of radio frequencies reserved for Amateur Radio, there are a huge number of radio stations: BBC, Radio Havana Cuba, Radio Moscow, Radio Netherlands International, and WWCR in Nashville. For that reason, you might be content to just be a listener. Each radio frequency has its own characteristic. Some work best in the day. Some work better at night. Amateur radio operators are assigned to certain designated frequencies ranging from 1900 KHz (1,900,000 cycles) on the 160 meter band up to 1270 MHz (1,270,000,000 cycles) on the 23 centimeter band. However, for now, I will limit myself to the 2 meter VHF band (Very High Frequency) and Short Wave HF (High Frequency band ranging from 80 meters to 10 meters). VHF (Very High Frequency) radios required a Technician Amateur Radio License. These are the hand held radio or most radios mounted in vehicles. Hams also call them 2 meter radio because it makes them look smart and it also indicates that the radio wave length happens to be two meters long (80 inches). They work for short range communications, which means ‘line-of-sight’. To legally use them, you need an Amateur Radio Technician License and a radio costing between $70 to $400. To get greater range, amateur radio clubs will build repeaters and mount the antenna on something tall, such as a water tower, building or even some companie’s cell phone tower (with permission). The repeater receives the signal from the hand held radio and retransmits it on another frequency. So, here’s how this works. If I want to talk to someone on my hand held radio and he is not line-of-site from me, I will transmit on frequency ‘A’ with 4 watts of power. The repeater, which is on a tower, receives the signal and retransmits it on frequency ‘B’ with 20 watts of power. My friend, who is also line-of-site of the tower, received the transmission on frequency ‘B’. When he replies, he transmits on frequency ‘A’. The repeater does what it does and I listen on frequency ‘B’. This is called duplex mode. It greatly extends the 2 meter radio’s effective range. It also means that if there is a massive power outage, the repeater might not be working. Some repeaters have batteries but they have a limited life. When the repeaters are no longer working, you can switch to simplex mode, that is, you listen and transmit on the same frequency, but with a shorter working range. 146.520 MHz is the national simplex frequency. Most hand held 2 meter radios can also serve as a police/medical/firefighter scanners, which can provided a wealth of information. The next step up is HF (High Frequency) radio, also called short wave, which requires a General Amateur Radio License. This is the radio that allows you to talk all over the world by bouncing radio wave off the upper atmosphere. There is an art to doing this and hams will spend years perfecting this art. Understanding the principles of radio and radio propagation will give you a big head start in learning what’s happening in the world even if you never choose to get a license. You can get a HF Radio receiver for $50 and a transmitter starting at $200. These radios are usually confined to a location such as your basement, garage or the room you designate as your ‘radio shack’, partly because of the size and partly because a good antenna is quite large. One of mine is 110 feet long and is strung between two trees. The other antenna is called a Yagi and it looks like a giant TV antenna. It is possible to have a HF radio in a vehicle but the antenna is significantly compromised. When the 1995 earthquake hit Los Angeles and knocked out electrical power in Idaho, Wyoming and Washington, with my shortwave antenna, I was able to pick up a commercial AM radio station that was 200 miles away and I learn much about the quake in California. To start, go to http://www.arrl.org/, click on the ARRL Store and get the ARRL Ham Radio License manual. If you have a good local library, you could borrow one there or borrow one from another ham. This book will teach you many interesting things. It contains the test question pool and their answers for the Technician License. You only have to answer 30 questions, you just don’t know which 30. After that, you can go for the General License with ARRL’s General Class License Manual or take the General Course on line. You’ll need to find a club. From http://www.arrl.org/, select What’s Popular: Clubs. Put in your locations and you’ll get a list of Amateur Radio Clubs. Or you can click on Exams. The clubs are the guys that administer the test, but you don’t need to be a member to participate. Amateur Radio operators are a gregarious group. They are mostly males, older and they are a disappearing breed. No one is quite sure why there are so few women because any woman who shows an interest in ham radio will get a lot of attention. (I guess it is similar to the question of why women don’t like football.) The club members will answer question, loan equipment and help you solve technical type problems. These were the guy that handled much of the communication during the Hurricane Katrina recovery and they did it at their own expense. 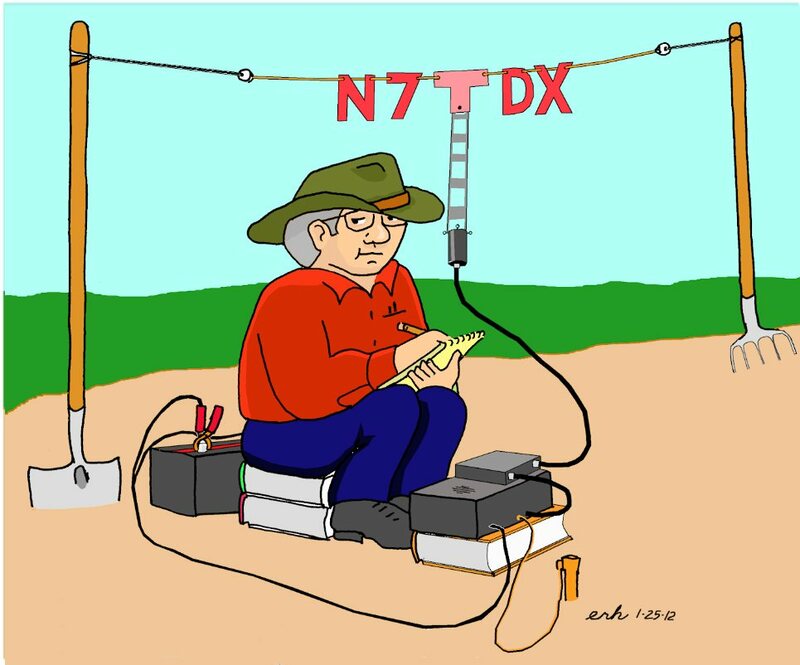 Ham radio operators have a soft spot for CB radio operators and that is usually out behind the barn where the digging is easy. Hams like to refer to CB radio as ‘11 meters’. CD operators have their own language which hams will not use. (You don’t call me ‘good buddy’ and I won’t puke.) CB operators have ‘handles’. Hams have call signs. Transmit a question on CB radio and fifty people will answer all at the same time. Ham radio has protocol and discipline that allows people to take their turn and communicate effectively. All Amateur radio operators have a certain obligation to help during an emergency. During a network exercise or during an emergency, a net controller allows people to speak only after they have permission. The amateur radio call sign has a specific format. Tell a ham that you are L59JY and he will know you are a phony. You can’t even adopt one when you know the format because hams also have a ‘phone book’. Give your call sign and they will know your name, address, which license you have and when you got it. A CB transmits with 4 watts of power and is legally limited to 50 miles—thought some operators cheat. A typical hand held ham radio transmits with about 4 watts. With mine, I could hit a repeater 60 miles away. A car mounted 2 meter radio transmits with about 20 watts of broadcast power. A typical HF rig will transmit with 100 watts of power but in some cases can legally transmit much as 1500 watts. This is a good article every non ham should read.